As this new generation of young leaders gains an increasing amount of organizational spending power, B2B marketers must find new ways of reaching them in order to drive sales. Video webinars are a great tool for accomplishing this task. Why are videos so effective for targeting Millennial customers? Consider the fact that millennials spend 48 percent more time watching online video than does the average Web user. So, by embedding video in your next webinar, you will stand a much greater chance of capturing the attention of younger decision makers across the enterprise. This doesn’t mean you have to stick with traditional webcam-style video presentations to showcase your moderators or guest presenters. 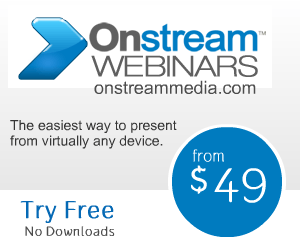 Through the help of a webinar services provider like Onstream Webinars, which supports a wide range of multimedia file types, your business can embrace cutting-edge video solutions like real-world case studies and product demonstrations. You could even take your next big YouTube production and host a premier release via webinar, including a question and answer section at the end. Millennials, after all, don’t want to just be given information they can easily find online. They want to be “wowed” through high-quality video presentations and informative question and answer sessions. Click here to learn more about how Onstream Webinar can help you accomplish this.